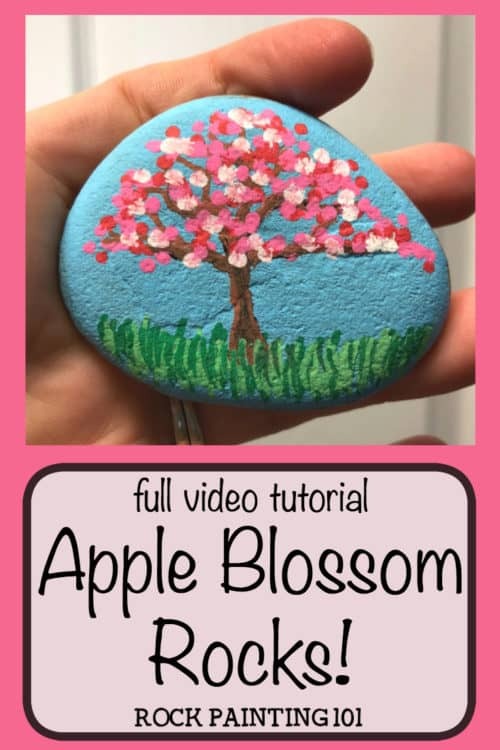 This apple blossom rock is a perfect example of how dot painting doesn’t have to be difficult. 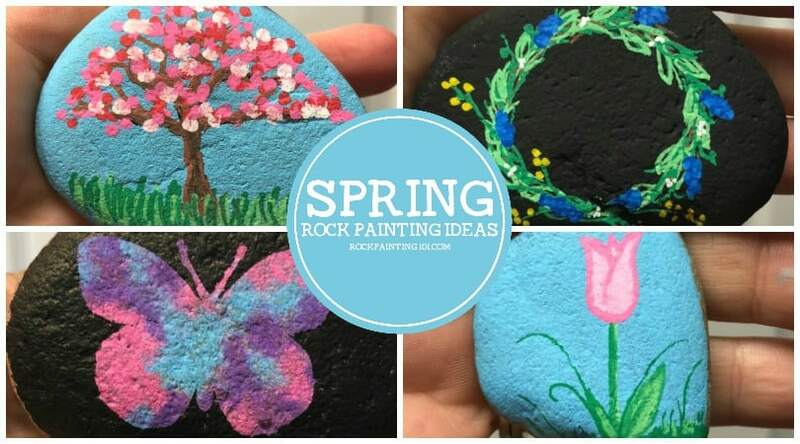 Using a simple dotted rock technique, you can create a beautiful spring rock. My favorite thing about spring is when the trees bloom with gorgeous blossoms. It’s so lovely to watch the trees change and welcome in the new season. This week, on our #52Rocks! challenge, the theme was dots. Not everyone can sit and do the Mandala style dot painting, so I wanted to do a dotted rock style that didn’t require the precision that other styles require. 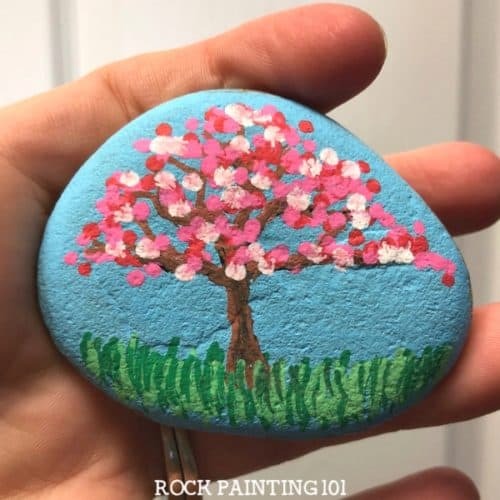 How to paint a spring tree on a rock! 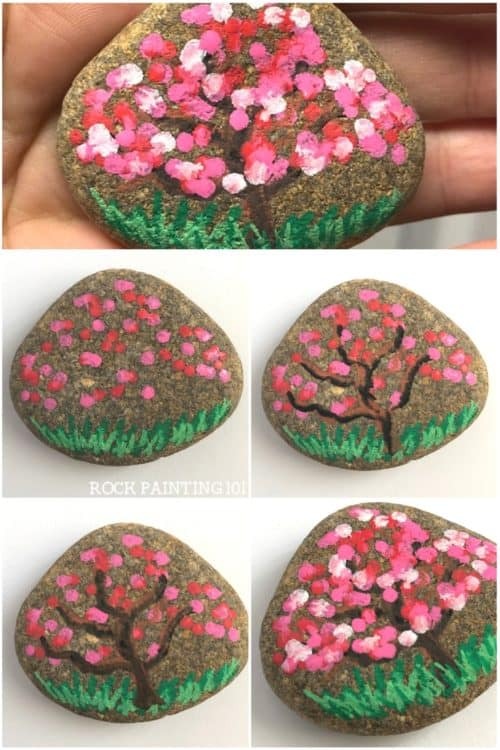 You can grab the Posca pens that I used for the blossoms on this rock here. This tree is an apple blossom tree, however, you could easily create a cherry blossom tree by making the tree taller instead of wider! Start by adding a couple colors of dots and a couple layers of green stripes for grass. When creating my trunk, I like to start at the top and bring my branch all the way down to the trunk. Each branch will make the trunk bigger. 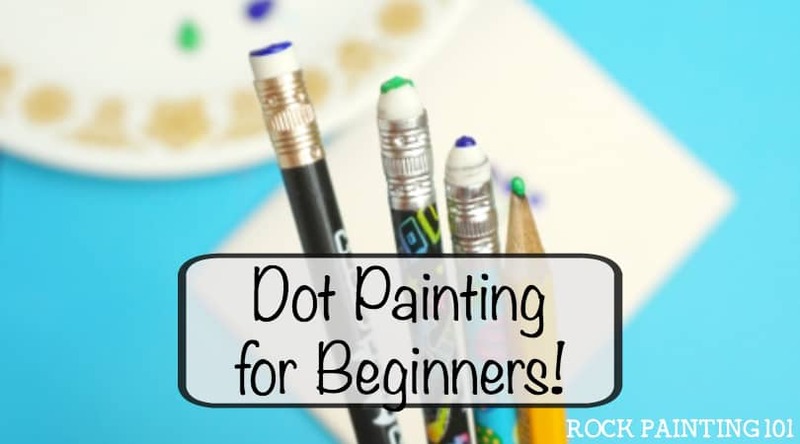 Make sure that there is a branch going to each of your dots. You don’t want any floating blossoms! To give the trunk the effect of bark, grab a black paint pen and shade the underside of a few branches and a little down the trunk. Then grab the brown pen and pull the black through before it dries. Add a few stripes of green in front of the apple blossom tree trunk so that it looks like it’s sitting in the grass. Make sure that the brown trunk is dry before adding more blossoms. Try to aim for your branches, but don’t worry about perfection. Repeat with another color right away. And finish up with some white dots. 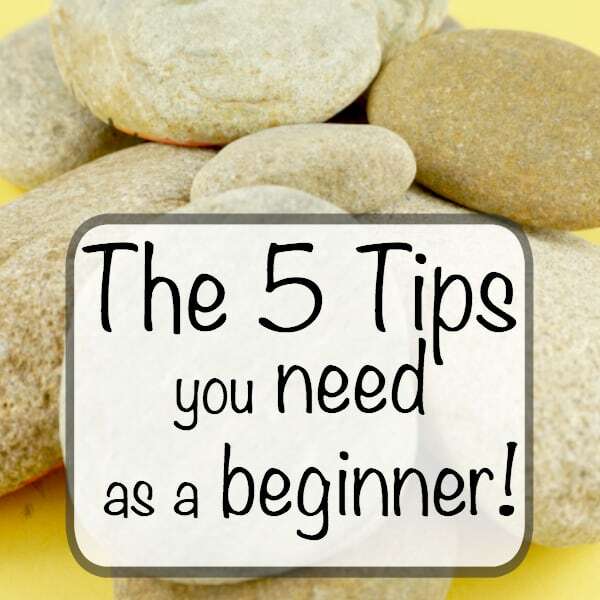 101 Tip! 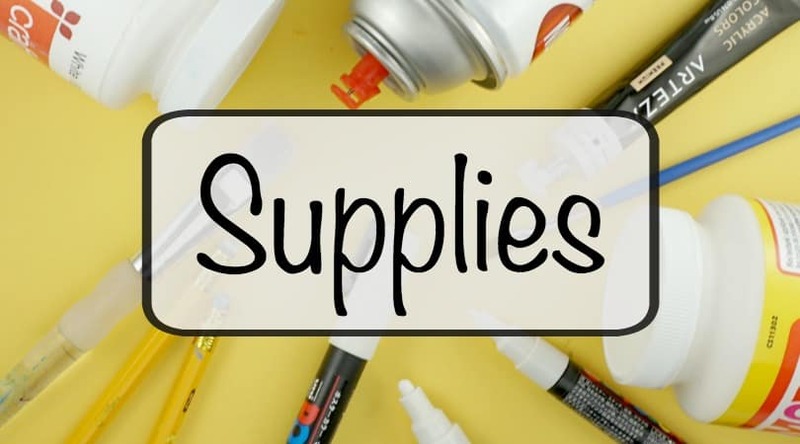 : If you get some pink onto the tip of your white Posca paint pen, just grab a piece of paper and start drawing. The pink will come right off! 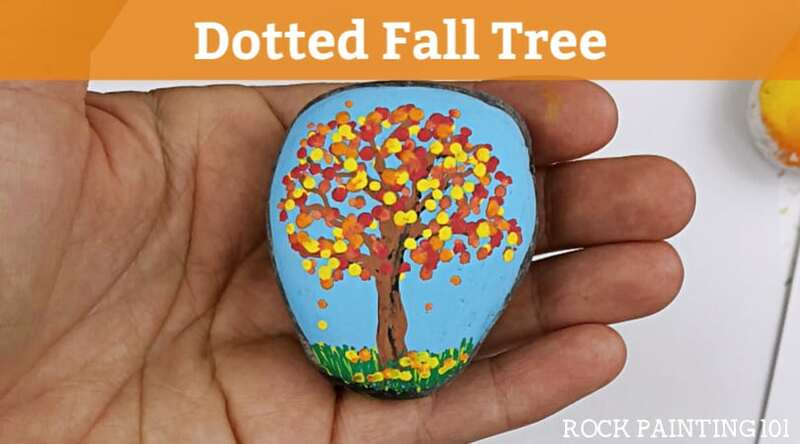 How fun and simple was this rock painting idea!! Pin this Spring rock to your favorite Pinterest board! If you create one of these dotted rocks, please share it with us!! Leave a picture in the comments of our Facebook Live!